I was actively rooting for Assassin’s Creed: Altair’s Chronicles to succeed and prove Hideo Kojima wrong. Kojima, the celebrity developer of the Metal Gear series, professed that he was skeptical of the ability to adapt stealth gameplay to the iPhone. Assassin’s Creed, like the Metal Gear series, relies heavily on sneaking around enemies and disposing of guards quietly. The Assassin Creed universe is set in part during the crusades in a number of Middle Eastern cities. Stealth rules the day in Assassin's Creed, but sometimes combat is unavoidable. But the clipping, pathfinding issues, and finicky movement controls of Assassin’s Creed: Altair’s Chronicles distract from what could have been a great game. Kojima seems to be getting the last laugh (though Metal Gear Solid Touch has its own flaws) because Assassin’s Creed is a half realized mess of an adventure game that seems to have unlearned everything great that Hero of Sparta taught Gameloft. Combining stealth, swordfighting and platforming components, the iPhone version of Assassin’s Creed is a graphically superior port of a Nintendo DS title with the same name. Unlike Assassin’s Creed’s for the Playstation 3 and Xbox 360, Altair’s Chronicles focuses exclusively on Altair’s linear story from his perspective. As a member of a brotherhood of assassins, Altair seeks to track down a mysterious “chalice” for his order and must seek revenge on a troop of Templars that have slaughtered some of his comrades. The opening full motion video for the game displays the iconic Altair character in a bustling middle-eastern cityscape. If the game is anything like this, then Gameloft will have magically produced a game with graphics comparable to the Playstation 3 on the iPhone. The truth is that the actual graphics for the game are more pedestrian, but by no means poor for the iPhone. And there are nice little details in the game. You can pickpocket enemies via a clever mini game. The environments are varied and you get a sense of the enormity of the city you are part of. 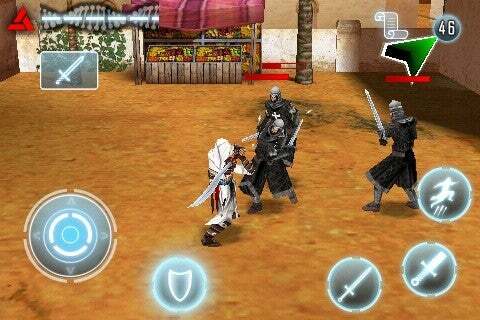 Much of the spirit of Assassin’s Creed has been kept for the iPhone version, save perhaps the open-ended gameplay. Altair learns a variety of cool moves as the game progresses, but most of these are event specific and you’ll get to use them a few times. For example, you’ll only stealth kill certain targets when the stealth button appears. Using your grappling hook is limited to when there is a specific nook to launch the hook into. The most frustrating aspect of the game is the checkpoint system. Rolling in gravel and then throwing yourself into a salt mine would be more pleasant than the crap platforming areas Assassin’s Creed puts you through. The game saves whenever you touch a checkpoint icon. This is great except they don’t disappear after you’ve hit them once. If you hit a checkpoint and climb a ladder and then jump and hit another checkpoint, if you then fall to the ground you’ll have to hit the first checkpoint again and thereby lose all of the progress you gained. The arrows will guide you to go and hit previous checkpoints you have skipped, thereby ensuring you complete the game in a specific order. This also ensures that if you keep missing that one jump, you’ll be stuck doing that same area forever. Of course, this wouldn’t be a problem if the controls were more forgiving. Jumping off a beam and falling to your death is common, but even more common is falling off a beam and landing alive in an area you’ve already explored. You’ll then have to start all over again or reload the previous checkpoint. A manual save system would do wonders here, but a control system that isn’t so finicky would be even better. It shouldn’t take me twenty tries to jump from one beam to the other. I do this for a living. I’m not that bad at gaming. The combat controls aren’t much better. You unlock new skills and combos as you play, but initially you can launch two kinds of sword attacks or block. From the block position you can counter, which is a nice little nuance for a mobile game. Of course, as an assassin, it’s preferable to flee, but it’s nice that when you do have to fight you’re not useless. On the whole, I enjoyed the combat system against enemy guards. The problem is that the poisonous asps that populate the rooftops are much deadlier. Your attacks almost always swing above their little heads, and manipulating Altair into a better position is impossible with such sensitive controls. Aside from falling, asps are the most deadly obstacles in the game. Sound on an iPhone has rarely been more than background noise to me, but Assassin’s Creed is a rare exception in that I’ve noticed not only the voice-acting but also the sound effects. While the voice acting isn’t anything special (Altair doesn’t sound particularly intimidating or killer-like) the sound effects cut in and out during the missions to become an annoying distraction. Assassin’s Creed: Altair’s Chronicles is one of the most ambitious titles for the iPhone yet. The game takes several hours to complete (think 6-10+) and is therefore one of the most lengthy (and challenging) iPhone games I’ve played. While Hero of Sparta was a simple hack-and-slash adventure game, Assassin’s Creed walks a tightrope of stealth, combat, platforming, and puzzles. Unfortunately, right now the rope has been dipped in gasoline and lit on fire by the frustrating save system, hair-trigger controls, and atrocious pathfinding problems. Future updates will hopefully solve some of the many adaptation problems that have sprung up during the port process, but right now Altair’s Chronicles isn’t living up to the Assassin’s Creed or Gameloft name.